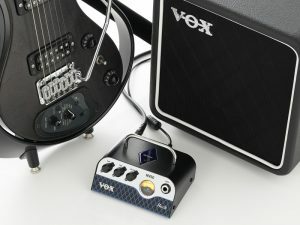 The Vox MV50 is a tiny package that packs a punch as well as oozing all that Vox style and quality. Vox has announced the launch of its innovative MV50 guitar amp which, we think, is going to take the guitar amp world by storm. Just don’t mention the size! The Vox MV50 is a genuinely innovative approach to guitar amplification. In a world where big is seen to be better the MV50 is a compact unit. But don’t be fooled by its diminutive size, it packs quite a punch. Weighing in at fewer than 500 g the MV50 boasts 50 watts of power and all the tone you would expect from a Vox amp. At the heart of the Vox MV50 is the Vox Nutube, a revolutionary vacuum tube launched by Vox back in 2015. The Nutube is essentially a shrunken down version of a triode vacuum tube. The Nutube works in exactly the same way as a normal vacuum tube. It has all the power and tone you would expect but is just a fraction of the size. There is the added bonus that the Nutube is a lot more robust compared to a conventional vacuum tube so the up-keep issues associated with tube amps have greatly reduced. Vox have paired the Vox MV50 pre-amp with a state of the art power-amp to give an amazing combo that will really give you amazing power and tone in a very compact unit. The power amp is the Vox BC108 which Vox have specifically designed to work in harmony with the Vox MV50. The entire unit of the MV50 pre-amp and BC108 power amp is a compact unit which can be used to practice in your bedroom but has the power to be heard if you are a gigging musician. Paired with the BC108 power amp the Vox MV50 kicks out a massive 50 watts of power. Vox have designed three different versions of the MV50 in an attempt to capture some of the classic guitar tones that we guitarist are looking to recreate. First up is the MV50 AC Set. As the name suggests the MV50 AC Set has been designed to recreate the sound of that classic British rock amp the Vox AC30. If you want that chiming crunch typical of the AC30 then this is the pre amp for you. The Vox MV50 Rock delivers more aggressive tones so if you want that high gain crunch the Rock is going to be the one for you. Finally the Vox MV50 Clean provides beautiful, natural clean tones at high volume without distorting. As with anything that comes out of the Vox factory the Vox MV50 and BC108 look classy with cool retro styling typical of Vox. 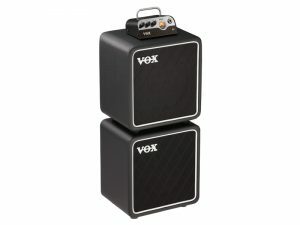 For more details about the Vox MV50 and to see the three versions in action check out the video below. Vox plan to release the MV50 in the spring so check back or sign up to receive our news updates and be the first in line to get one of these great amps. For more details check out the Vox website. Learn Sweep Picking in 100 days?